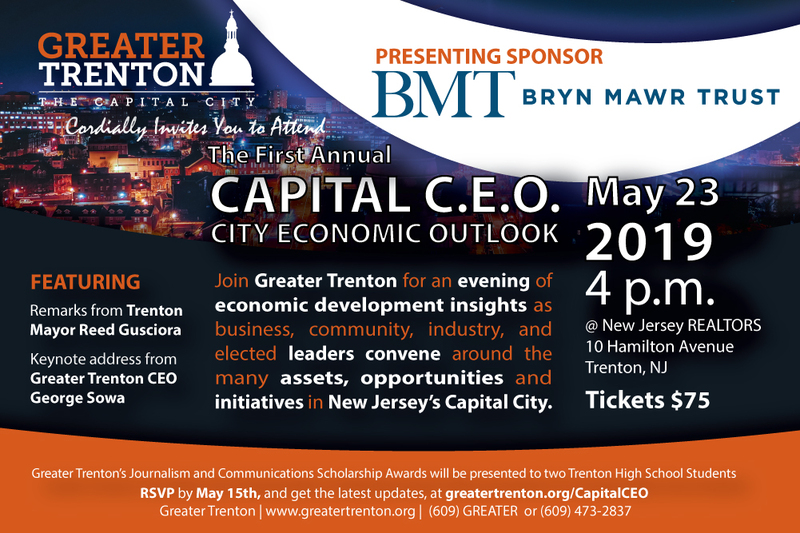 Join Greater Trenton on May 23rd, 2019 from 4 p.m. to 6:30 p.m. for its First Annual Capital City Economic Outlook Event, an evening of economic development insights, as business, community, industry, and elected leaders convene around the many assets, opportunities and initiatives in New Jersey’s Capital City. The event will help focus attention on Trenton as a hotspot for development and feature opening remarks from City of Trenton Mayor Reed Gusciora and a keynote address from Greater Trenton CEO George Sowa. Attendees will learn about the groundwork and visioning happening in Trenton, discuss specific opportunities and the best ways to capitalize on them as well as the necessary steps to ensure that these and future projects are successful. Your ticket purchase will welcome you to the third floor of the headquarters of New Jersey Realtors where you will enjoy an Open Bar and Hors d’oeuvres while interacting with business leaders, architects, developers, bankers, insurance professionals, wealth managers and community coalition builders. Take away new findings and metrics to help you make informed decisions. Greater Trenton’s Journalism and Communications Scholarship Awards will be presented to Two Trenton High School Students, who will work during the summer as writers for TrentonDaily. Ticket price is $75 per person. Only 100 seats are available so please respond early.